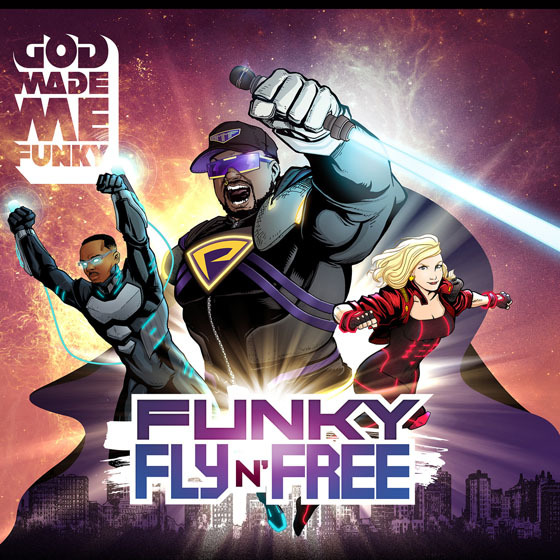 God Made Me Funky's latest LP is simultaneously vintage and futuristic, as if the Toronto troop soundtracked a deliberately cheesy '80s sci-fi flick. The album, named Funky Fly 'N Free, begins with a warp-speed-tempo title track. Its electro percussion reverberates like a lightsabre. Phatt Al, the band's MC, provides a fittingly retro sci-fi themed verse, with lines like, "If you're havin' a rough time today at all, forget postin' on Facebook, gimme a call." It's an extra terrestrial disco jam. The album's second tune, "So Complicated," is infused with synths that pulsate like neon lights, as singer Dana Jean Phoenix ruefully coos nonsensical space-age lyrics that make this New Wave suited for the Milky Way. "Digital Life" unfortunately falters; instead of using disco as a muse, it wallows in that era's every cliché. "Rollacoasta Baby" is even worse, mainly due to Phoenix's lyrics, which are overly sentimental and generic. The instrumentation is a bit better, featuring some thwacking artificial percussion and wind chime synths that are primed for AM radio, but it's still more likely to make listeners doze off than hum along.